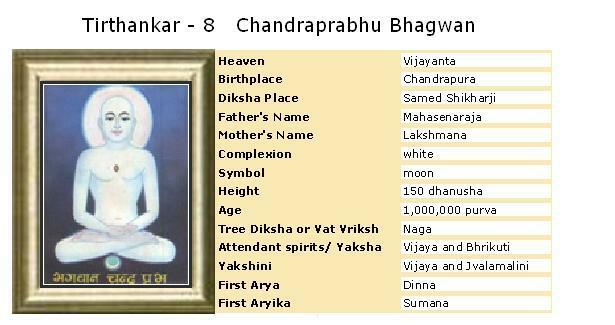 Bhagvan Chandraprabh was born in Chandrapuri, on 12th day of the dark half of the month of Paush. His father name was King Mahasen and Mother name was Lakshmana Devi. After long span of life time, he took diksha on thirteenth day of the dark half of the month of Paush along with 1000 other men's. After 3 months of diksha and worldly life abandonment Lord Chandraprabh attained (kevalgyan ) salvation on 7th day of the dark half of the month of Phalgun and constellation of Anuradha. On the 7th day of the dark half of the month of Bhadrapad, Bhagwan Chandraprabh , along with other 1000 saints was liberated and attained nirvana on Sammet Shikhar (mountain). Bhagwan Chandraprabh lived for 10 lakh purv of which he spent 24 purvarg less of one lakh purv as an ascetics and 3 months of Meditation and Spiritual Practices (sahdana/tap). It is believed that Chandraprabh prabhu was 150 measure of bow(at that time unit of measurement was bow i.e. bow of bow & arrow) in height. In his birth as king Padma of Mangalavati town of Dhatkikhand, the being that was to become Bhagavan Chandraprabh earned Tirthankar-nam-and-gotra-karma. Spending a lifetime as a god in Anuttar Vijay dimension he descended into the womb of queen Lakshmana, wife of king Mahasen of Chandranana town. During her pregnancy, one day the queen was looking at the splendors and glowing full-moon. All of a sudden she had a strange desire to drink the glowing streak of moon light. The king cleverly managed to satisfy this strange desire of a pregnant mother. On the thirteenth day of the dark half of the month of Paush the queen gave birth to a healthy son who was fair and glowing like the moon. He was named Chandraprabh (glow of the moon). Chandraprabh was apathetic towards the mundane pleasures and princely grandeur. After he ascended the throne his reign was short lived. He became an ascetic in the prime of his youth and just after three months of acute spiritual practices he became an omniscient. For a considerably long period he continued to enlighten the people and propagate the true religion. When his end approached he went to Sammetshikhar and after a month of long fast and meditation attained Nirvana.